It’s Labor Day here in the U.S.: an annual holiday on September’s first Monday that celebrates the American labor movement and honors the social and economic achievements of workers. 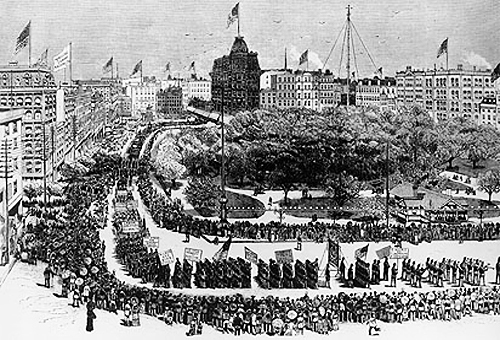 Labor Day was first marked in 1882 in New York City. What does labor actually mean? Merriam-Webster and Oxford Dictionaries define labor (spelled labour in the UK) as an expenditure of physical or mental effort, especially when difficult or compulsory. It also describes the human activity that provides the goods or services in an economy, the services performed by workers for wages (as opposed to those rendered by entrepreneurs for profits), and an economic group comprising those who do manual labor or work for wages. Last but certainly not least, labor is the name for the physical activity (ie. the dilation of the cervix and contraction of the uterus) involved in giving birth, and the period of time that such labor takes. The word’s first meaning, of “exertion, trouble, difficulty, or hardship”, dates back to the late 14th century. A couple of centuries later, in the 1590s, its meaning expanded to embrace the physical exertions of childbirth, and from 1839 it denoted a body of laborers considered as a class. The word labor is also employed more poetically in three common expressions. “A labor of love” is a task done for pleasure, not reward. “To labor the point” is to explain or discuss something at excessive or unnecessary length. And “to labor under” means either to carry (a heavy load or object) with difficulty, or to be deceived or misled by (a mistaken belief): people are said to labor under an illusion, a misapprehension, or a theory. “All labor that uplifts humanity has dignity and importance and should be undertaken with painstaking excellence.” — Martin Luther King, Jr.